The Cave Kids: Picture That! Long before there were words and languages, cavemen used pictures to communicate with each other. Why don’t you give it a try? 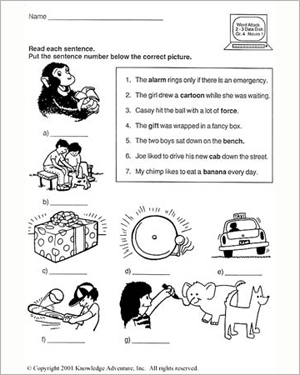 See for yourself how drawings can take the place of sentences in this fun reading worksheet for third graders. Read the sentences in the box, and then match each one to the picture that shows the same thing. If you’re sure you know the meanings of all the words in bold, solve the puzzle in ‘The Cave Kids: Riddle Time’ to find out the answer to the fun riddle in the worksheet.